Filter coffee and or/ Capsules with Nespressomachine. Standard Tee Varieties. Cow-Milk is provided. Self Service. For 10 people or more: Menu 1: 2-3 different kind of salads, 1-2 piece of cake. Possibility to get the quiche and the soup for an extra 3.50€ or Menu 2: SIGNATURE BOWLS; Burrito Bowl/Oriental Bowl/ New Avocado Bowl. Half Wrap per Person and Dessert. Served in your room. SIGNATURE BOWLS; Burrito Bowl/Oriental Bowl/ New Avocado Bowl. Filter coffee and or/ Capsules with Nespressomachine (Cow-Milk is provided). Standard Tee Varieties. Coca Cola and apple fizz in small bottles and in Mineralwater from waterdispenser (sprakling or still). Self Service. 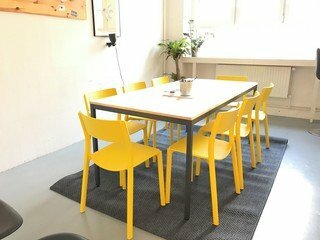 This is the perfect office if you are looking to have a workshop or a coaching event with activities in several groups. 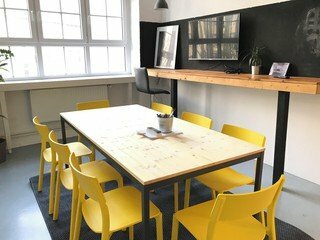 The office features three individual rooms and the entrance area with coffee machine, fridge and microwave - and you will have it all to yourself. There are a large workshop room and two smaller rooms. - conference table that can be separated into three and a breakout area with lounge chairs. Up to 20 people in theater setting. A projector is included in the rental fees. Any materials like flip charts and facilitator's box are available for a small fee. 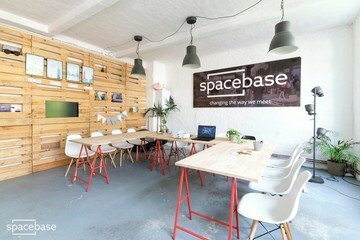 As a sharing economy startup, we at Spacebase live what we preach and rent out our very own former office. 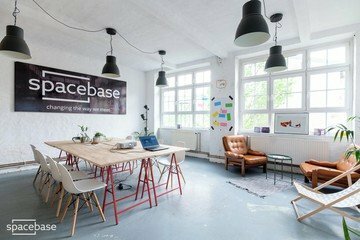 The venue is a typical startup office in the backyard of an old industrial building. While the outside looks rough, the office itself is warm and welcoming. If you are interested, we would love to show you 'our' area. We enjoy giving tips on what to see in Berlin. Especially for our favorite neighborhood Kreuzberg with the relaxing Landwehrkanal we have many recommendations. In case you book the office throughout lunchtime, you should take your time to enjoy one of the many restaurants. In our building, there is a nice Italian restaurant and across the street you will find a well known Korean restaurant with a great lunch menu. You are more than welcome to book over the weekend, please keep in mind that there is no cleaning service are we are not personally at the location on weekends. 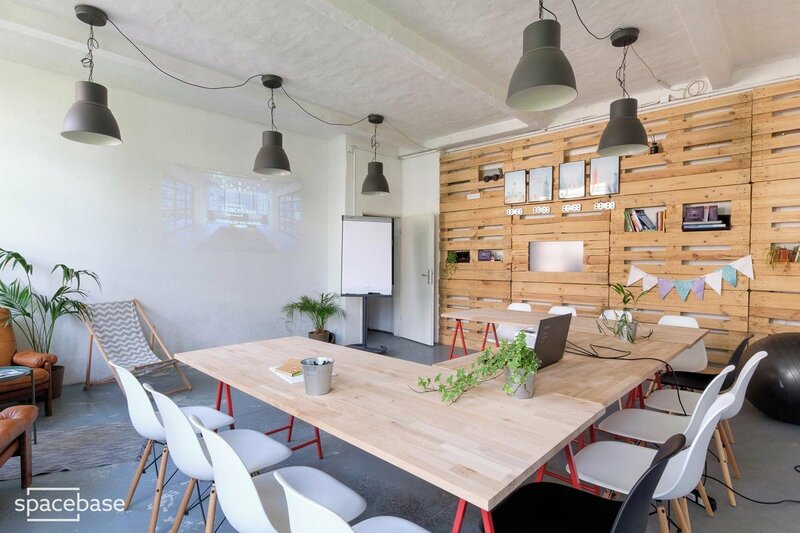 This bright and clean space is perfect for meetings, training workshops and and seminars. 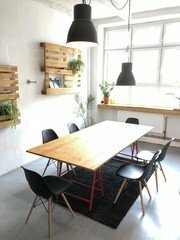 The room is just 100 meters from Görlitzer Bahnhof on the U12. Kottbusser Tor on the U8 is also a three minute stroll away where Alexanderplatz can be reached within 10 minutes. We booked the entire place for 10 people, and we loved it. The main room was big enough for the main part of the workshop, and the breakout rooms were very useful. Nice location, good equipment and friendly staff. We had some special requests regarding the organisation of the room and they helped us with it. Only downsides are that it was a bit cold, and also there was only one toilet and one coffee machine for all of us. Since we were taking breaks at the same time we often had to queue a bit. I assume if you rent the place for more than 10 people, or if you only rent one room (and hence other rooms are potentially booked by other groups), it can get tricky. It was great! I'll definitely book again :) The only improvement you can do is send the SMS with the code to close the door. It must have been forgotten in my case and I had to call you to get the code. Other than that, everything was perfect! The space was perfect for students taking examinations. The tables were large with enough room for each student to spread out. The several small rooms enabled each student to have a place to work with privacy and without distractions. The venue was bright and light and airy. Adriana was very helpful and attentive from booking to closing of the space. 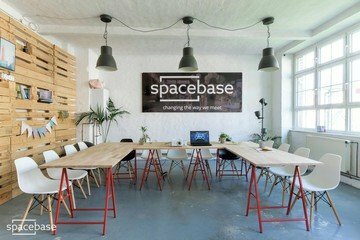 I would definitely use Spacebase again. Hi, my name is Adriana Besser.